By John M'Master, Culhorn, Stranraer. Introduction.—It is not expected that the following report will take any place of merit as a literary production ; the writer happening to be one of those at whose instance the Cheddar system made considerable advance in the south-west, being the only claim to notice by the Highland Society of Scotland. The history, the improvements, due either to the discoveries of our own, or imitation of foreign makers; what science has done, what left undone, in enlightening us in dairy management; and what is perhaps most important, a detailed description of principles and practice which should guide any intelligent person in making fine cheese, will be faithfully sketched. In all of which the standard of a practical farmer, who has given this subject considerable study, spent time and money on the mechanical appliances, and either on his own account, or through consultation with the best scientists with whom he came in contact, is that by which it may be judged. The Dairy District.—It has often been remarked how nearly the results of haphazard, continuous, ordinary and rather unintelligent practice, coincide with the sager and more abstrusely reasoned conclusions of the best theorists ; and the general outlines, which dairy husbandry has formed for itself in Scotland, lend considerable force to this position. The counties of Argyll, Renfrew, Ayr, Lanark, Wigtown, Kirkcudbright, and Dumfries, or speaking more roughly, the western half of the country, is embraced in the dairy belt; the bleaker and north-western portion of the "Highlands and Islands" —to which it might even have a profitable extension—being the most notable exception. It is now well known—what probably was not formerly even guessed—that the precipitation of the moist-laden winds from the Atlantic favours the district for dairying ; and not only the moisture, but the high temperature to which it is raised by the breath of the Gulf Stream, still further aid in developing the early and bulky herbage, and large crops of turnips for which the west is famous. The drier and colder east may have an advantage in cattle and sheep feeding, but except in the vicinity of large populations, where butter and milk bring an exceptional and relatively high price, compared with cheese averages, dairying will have a slow growth and disappointing results. The west, then, is the dairy country par excellence. It is, however, quite clear that Galloway then lacked the reputation for cheese it has since acquired. Indeed, within the memory of the writer, the dealers, principally from Ayr and Lanarkshire, had a significant horror of Galloway cheese. It was only in 1797 that the first large dairy herd was established in Kirkcolm, Wigtownshire, by Mr Ralston; but shortly after, numbers of Ayrshire farmers, who had similarly migrated, followed suit. Up to 1850, however, dairies were not numerous; but the high prices of Crimean war times, and the high rents of arable land, which were the consequence, stimulated that system. The increase was first mainly in the Rhins or western district of Wigtownshire; but the Machars, which was, relatively to the other, the richer and feeding district, soon caught the infection of what seemed to be a more profitable movement. On account of the contempt with which it was viewed by the more wealthy farmers, it was with the utmost reluctance, and the regrets usual in all caste relegations, that one after another "kept kyloes." In Kirkcudbright the feeding caste was also strong, and as it was a district of high class Galloway cattle, the Ayrshire cows were spoken of as "Spotted beasts," and the owners—especially those from Ayrshire, who were supposed to live on whey-—with no great measure of respect. By this time a class of middlemen, also chiefly from Ayrshire, had been developed. They were then termed "bowers," and rented the cows' produce, thus relieving the farmer of the management. They are now, however, more generally hired for management, and termed dairymen. It is to some of them, who combined acquired information with careful experiment, that a great measure of subsequent improvement is due. Mr James M'Adam had adopted the Cheshire system, and with very considerable success, so early as 1844, when located at Balter-son, near Newton-Stewart. At the Highland Society's Show at Dumfries in the following year the judges withheld a premium, which they thought his sample deserved, on the supposition that such ripe cheese could only be of the previous year's make; but at the Edinburgh meeting in 1848, the highest honour was conferred. His cheese had then acquired a wide reputation, and brought l½d. per lb. above the average price. In 1854 the Ayrshire Agricultural Society sent a deputation to Somerset, to acquire a knowledge of the Cheddar system, which, previously limited to a small district, was now fast widening its reputation and its sphere. Unfortunately, the gentlemen composing the deputation were not cheese-makers, and the result of their labours was the appointment of a Somerset teacher—a Mr Harding—and at a subsequent stage, a Mr Norton. In 1855, Mrs Robert M'Adam, then in Baldoon, went to Somerset, and the improvement which took place in the general manufacture in Galloway dates from her return, and the lessons subsequently learned in her dairy—not that this was the introduction of the method, for a Somerset dairymaid had first made Cheddar near Castle-Douglas, and Mr Robert M'Adam had seen Mr Harding discourse in Ayrshire. James had even experimented at the time he was engaged with Cheshire, but no great standard of perfection was attained, until the information acquired by Mrs Robert had been weighed in continued practice and tested by successive experiments. At this time, however, specific periods of time regulated the process, and irregular makes were common. The writer had, in common with the M'Adams, made fair cheese, taking first prize at Stranraer in 1860, with Alexander M'Adam (who was then about the best maker) in competition. But being still dissatisfied, he went in 1862 to Somerset, and found fine dairies few ; irregular and poor, much more numerous. A Mr Somers, near Shepton Mallet, had the finest he saw, but this gentleman had never exhibited; while, on the other hand, one who had acquired a reputation in the north was 14s. per cwt. behind him in price. On returning, the improvements noted and the experiments suggested from a well-kept register were imparted to all and sundry; and as Robert M'Adam was similarly engaged, a very marked advance in price bore testimony to the results of their efforts. In 1868 the writer had due appreciation, in a presentation of plate by twenty-five proprietors and farmers, who had profited by his teaching. The interest taken by him in mechanical appliances, and the construction of cheese-rooms and dairies, was well seconded by the proprietors, and no little of the superiority of Wigtownshire to Ayrshire and the Stewartry was due to the earlier recognition of this department. The writer claims the introduction of steam below the tub, between the false and true bottom, and some less notable improvements; but he would have it clearly understood that it would be unjust to ignore or detract from the large contribution to the Cheddar system by the M'Adams. The Hannays, Harcomb, Sawers, Baird, Smith, and others more or less famous are their disciples ; and the cheeses exhibited by Alexander at Kilmarnock, if equalled, have never been excelled. Robert has made a name in America, and his papers read at the dairy conventions are reckoned as emanating from the best practice, and a knowledge of the theory which leads to it. As a matter of fact, of the pupils of the Somerset men who came north as preceptors, very few made any mark in the show records, and none of them a very high one. In 1869 a challenge for £200 aside, sent by the Galloway to the Somerset makers, was declined. The general opinion among the dealers most conversant with both was, that one or two of the best prizes would have gone to Somerset, the greater number to Galloway. Dunlop Characteristics.—The aim of the Dunlop makers was to avoid acidity, consequently the evening's milk was thinly distributed on the vessels, and the temperature kept low. In the process much rennet and high temperature were used, and hot, not sour, whey occasionally added. The curd was first cut into large pieces about 4 inches square, then several times, until an inch square was reached. The remainder of the process is similar to Cheddar, which will be detailed at full length. It is, however, to be noticed that the Dunlop maker aims at what Dr Voelcker considers the best practice in regard to acidity, viz., taking off the whey when it is not noticeable to the ordinary observer; and what he erroneously sets down as absolutely neutral. Subsequent Decline.—-That the quality of Cheddar cheese has since 1870 suffered materially is without question. It was noticed by outsiders, and especially the dealers, but the latter were not credited with a disinterested motive. American cheese, which had been previously inferior, was moving in the contrary direction, and noticed both by travellers and in the London markets. The causes of this deterioration are—first, the reaction which almost invariably follows an abnormal effort; second, some of the best authorities lessened their interest, and less careful ones were only going for whatever would lessen the work and shorten the process; third, the use of sour whey usually discouraged by the very best makers was more and more indulged in; fourth, the sour whey was usually kept over and in a manner to engender impure flavours; fifth, the temperature of the evening's milk was usually too low in the morning; sixth, too much whey was retained in the cheese on account of weight, and also its being sooner marketable. These, briefly, are the reasons, but it must still be noted that there were always a few whose makes upheld the former reputation. But as the deterioration began to be more generally acknowledged, it was resolved to make amends; and as it was understood that there were some very fine Canadian and American cheese sold in London, attention was turned in that direction, and through the instrumentality of Mr Clement of Glasgow, the largest buyer in Scotland, Mr Harris of: New York State, who had acted as factory instructor in both Canada and New York, was engaged to instruct anew the cheese-makers of Scotland. Harris' Method—Difference noted.—Mr Harris prefers having the evening's milk at 68° in the morning. When the two meals are put together, he raises the temperature to 90° to "ripen." There is no difference as to colouring, but the rennet is not immediately added—only after the milk has sufficiently ripened. This is tested by a drachm of rennet being put to a gill of milk, and when this coagulates in twenty-five to thirty seconds, the ripening is complete, and the milk at 88° has the rennet added. Using knives rather than breaker, he scalds to the ordinary temperature, and no alteration occurs until the curd is put on the rack in the cooler. He mills the curd about halfway between leaving the tub and vatting. In cold weather he also introduces hot water about 110° below the rack, so as to hasten the work. There is no doubt that a better knowledge of how to handle rennet and salt in making a cheese suitable for easy marketing or the opposite, is due to Mr Harris. Process Detail.—Having fixed on the system of cheese-making to be pursued, the Cheddar being that almost universally endorsed in Scotland, and having completed all the arrangements, it is intended to follow the cheese-maker throughout the process from the time the milk leaves the cow until the cheese is marketed. The Milk itself.—Milk when drawn from the cow is impregnated with what is known as animal odour, and if this be not dispelled before commencing to make cheese, it will cause considerable annoyance, and very probably a cheese of indifferent flavour. It resembles mixed breath, and perspiration of the cow is present in greatest proportion in the newly drawn milk, and on exposure to the air is slowly evolved. If the milk is too quickly or too low cooled, it will not readily escape ; if too warm, it develops as readily as before leaving the cow ; but boiling effectually prevents its being formed. With such complex movements the cheese-maker is at a loss how to deal with it, but experiments made by an intelligent neighbour, in which the writer has carefully noted the effects, bids fair to defeat the redoubtable enemy, The milk is passed slowly over a refrigerator, without however applying cold water or reducing the temperature otherwise than by exposure to the air, and the results have been so satisfactory, that Saturday evening's milk can, without injury, be put in the Monday's cheese. Should this practice have universal adoption, cheese-making on the Sabbath could be altogether avoided, and give mutual satisfaction to those who have strong views on both periodical relaxation and Sunday labour. It must, however, be observed that quick driving of the cows, bad or stagnant water, and similar maltreatment, will increase animal odour, and hasten the arrival of acidity, so that it will take the best management to turn out a moderately good cheese. It then behoves the dairy farmer or dairyman to look well to the treatment of the cows, and along with it study, and thereby be able to counteract, the effects of this natural flavour. The Evening's Milk.—A knowledge of the quality of milk is desirable, and in the absence of anything like a quick and cheap analysis, the milk should be tested in a lactometer, so as to learn the percentage of cream, and thus the richness of the milk, because by that the future movements must to some extent be guided. The milk is then placed deep or shallow in the coolers and tub according to the weather, so that the temperature may in the morning run from 65° to 70°. If the milk has been run over the refrigerator, it requires, of course, to be set deeper. If then the temperature is too low, acidity is not enough advanced; if too high, the contrary ; but, as will be noted, good management will overcome either to some extent, and hence a study of relative temperatures is requisite, so that at any time the maker may readily grapple with what either hastens or retards. Steam may be used below the tub to raise the temperature after being refrigerated, if necessary, also cold water through the refrigerator to lower it. The Morning's Milk-—Being over 90° when drawn, it would be lowered by being passed over the refrigerator, and when mixed with the other meal the average will probably be 75° to 80°. Colouring.—The colouring, which should be the best obtainable, is first mixed with about a gallon of milk, then with the mass, and sharply stirred until the mixture is intimate. Some kinds of colouring make the cheese "heavy or leady," to use a trade term, but experience will guide fairly to a few of the best manufactures. 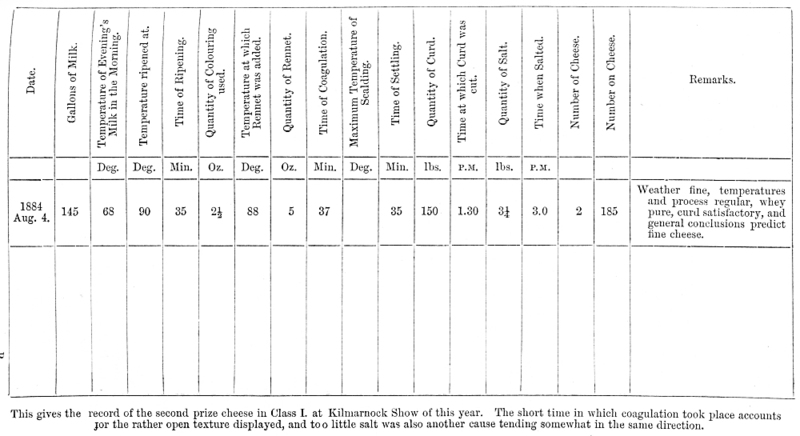 Ripening Tests.—The milk is now raised to the normal temperature of 90°, varying above or below according to the temperature and acid advance of the evening's milk. At this stage it is absolutely necessary to have some test of the " ripening," as otherwise the rennet may be added at a stage either too early or too late. After a little experience, the operator will know the proper tint to which to bring the litmus paper. Rich milk requires to be deeper than poor, so also deeper in cold than warm weather. The writer has frequently noticed, that although the evening's milk might in the mornings of different days be the same temperature, nevertheless the time required to bring the same tint on litmus paper would vary from twenty-five minutes to an hour and a quarter. There is almost no question of the litmus paper being superior to the sample coagulated by Mr Harris as a test, but it must be admitted that it is so only in the hands of one who has a good eye for colour, and who can readily distinguish the slightest difference in shade. 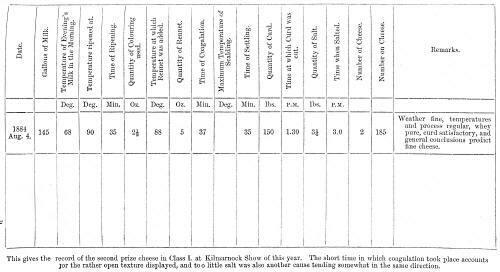 The paper too only serves for " ripening," not all through the process, and thus shows the need of what was, even in the early Cheddar days, called an acidometer. Another curious fact is observable in the use of the paper, that it registers acidity in newly drawn milk, not unlikely due to carbonic acid in the animal odour, but the normal tint holds when it is evolved, and with the developing of lactic acid, again responds. In any case the ripening depends largely on the state of the atmosphere, and a want of knowledge of this fact, or a due appreciation of it by the early makers, especially the pupils of the Somerset men, was the shoal on which many a "Kane" was wrecked. The Thermometer.—It is not so generally considered, as might be believed, that the thermometer should be critically tested before being used. That by which the medical faculty tests the temperature of the human body is very generally correct, and one should be kept for testing those which are in daily use. Rennet.—It is very important that the rennet should be strong and pure in flavour. For a detail of how to make such a solution, reference may be made to a report on "Dairy Farming as pursued in Galloway," and published in volume vii., fourth series, of the Transactions. It has been advanced by several authorities, endorsed by Mr Harris, that nothing will make so good curd as the calf's stomach; bat the 2nd prize, ton lot, shown this year in London by Mr Wither of Awhirk, near Stranraer, were "steeped" with a solution from a mineral base. The stage of "ripening," at which the rennet should be applied, is one to be narrowly watched, for if allowed to pass, the process has to be quickened, and the whey will be acid before the curd is firm. If anticipated, the process will be delayed, the curd will be too long in the whey, and become too hard and dry in the cheese. The register, of which an example follows, is here of great assistance in bringing the maker to a knowledge of the exact stage. The strength of the solution should also be tested before using in any quantity, so that the time required for coagulation may be uniform from fifty to sixty minutes. The temperature may have fallen somewhat; if below 88° it should be raised to about that point before the rennet is added. Cream on the Milk.—After the rennet has been added, the surface of the milk should be occasionally stirred with the bottom of the dipper, so that the cream will be kept from coming to the top, a tendency due to its less specific gravity than the milk, otherwise part would escape with the whey, rather than be embraced and fixed in the curd. Cutting the Curd.—The milk should coagulate to a proper firmness, and should not be cut either too early or too late, for with the former the finer particles of curd which are suspended in the whey, usually called "white whey," will be dissipated along with it; with the latter, the curd cannot be got fine enough, and it will also be toughened. Cutting intermittently afterwards, until the whey assumes a greenish tinge, will to some extent counteract too early cutting, while a more industrious use of the knife will have a similar effect on that which has been too long deferred. Heating the Curd.—The heat has at first to be raised very gently, because the curd is at this stage very tender. If the rise is too sudden, a glitty hard coating will form around the curd particles, and prevent the escape of the whey, the heat from acting more effectively, and besides, will liberate some of the butter fats, or at least some of the essential oils, to be lost along with the whey. Stirring after maximum Temperature is reached.-—It is a mistake to stir too long after raising to the desired point in scalding—98° to 102°—the effect being to prevent the finer particles from settling, and thus allow them to go off with the whey rather than join the main body in the bottom of the tub. Test for running off the Whey.—The elastic state of the curd to be desiderated, and well known to every good cheese-maker, is easily arrived at if the milk has been of good quality, and the acidity not too far advanced before adding the rennet; but if the opposite has obtained, the curd will not spring out after pressure in the hand—an indication that the cheese will not be a good one. The cause of this want of elasticity is the curd being too moist; and to obviate this, it should, as soon as acid is observed in the whey, be put in the cooler. Active stirring should follow, and for a longer time than usual, so as to get rid of as much whey as possible. And it is noteworthy that, provided the temperature is kept up, the curd, being in or out of the whey, has the same effect in advancing acidity. If the curd is still too moist, increase the quantity of salt when you arrive at that stage. The Cooler should be of such size as will deal comfortably with the largest quantity likely to be handled during the season. It is just the shape of the old zinc cooler which was used for milk, and in it is placed a sparred arrangement called a rack— about one inch and a quarter from the bottom—through which the whey drains off rapidly and thoroughly. A cover of canvas is required, and it should be longer and wider by a foot than the cooler itself. Milling and Salting.—After the whey has been well drained off, the curd is put to the end of the cooler at a depth of a few inches—more or less according to weather temperature—and covered for about twenty minutes. It is then cut about 6 inches square, and turned occasionally until ready for milling. This, as a rule, will be about an hour and a half, or halfway between the time the curd has been put on the cooler and that at which it is to be vatted. After milling, stir occasionally, so as to get rid of any gas or impure flavour, at least in some measure; but the use of the refrigerator surface, for dispelling animal odour, would almost certainly render this in most cases unnecessary. The stage at which to apply salt—for it stops the gathering acidity—is a critical one, and requires a pretty accurate test to decide. There are several, the most certain being the soft peculiar feeling, not inaptly named "velvety" by the Americans ; equal quantities of butter and whey exuding, on the curd being firmly squeezed in the hand; the response to the hot iron being the flavour of nice toasted cheese; the perception of acid by the smell; and it may be readily inferred that any more than one will likely render a better decision. 1. By using less rennet. 2. By keeping up slightly higher temperatures. 3. By breaking the curd finer before scalding. 4. By making the curd firmer before running off the whey. 5. By increasing the quantity of salt. Variations of Process at different Seasons.-—When the cows first go to the grass the milk is comparatively poor, consequently more rennet is used, and the means already mentioned for increasing moisture are called into requisition. When the volume of milk is small, it is richer, especially in spring and autumn, and those should then be adopted which prevent excessive moisture. In cold weather, the temperature of the dairy should be raised sufficiently by artificial heat; and if necessary for the fret-extraction of whey, hot water may be introduced in the cooler below the rack. When the weather is cold and the milk small in quantity, so that the evening's milk is too low in the morning, more or less of the milk should be kept over the twenty-four hours. If making only on alternate days, the milk requires to be kept at different depths—the first meal shallower and deeper as coagulation is neared. Appearance.—Cheese as regards appearance has its place among the fashions. The shape being thus settled, attention should be directed to having them all of one size, so as to present to a buyer an even lot. Even the surface requires finish, most makers scalding the cheese with a hot cloth so as "to sound it," i.e., give a smooth appearance, but care must be taken not to push it to the extreme. After being kept in the press for two days or so, neatly bandaged and removed to the cheese room, one end is then rubbed with melted butter, the other similarly, at the first turning on the shelves, a process which may with benefit be repeated. In short, a good cheese should look so, therefore the surface should be smooth and clean, and betray no irregularity in colour. Temperature of Cheese-room.—The ripening also requires attention, for although an imperfect cheese cannot be made perfect, yet a very good cheese may in this process be altered into a middling one. The construction of the building should secure certain and easy control of the temperature,—about 65° being the average desired; overheating melts the butter fats and they then become rancid, and injure the flavour of the cheese. Turning daily, and rubbing occasionally, must not be neglected. Quality.—A good cheese should be rich without being greasy, and possessed of a sweet nutty flavour, as well as a clear and equal colour. It should have a compact, solid texture, but not waxy, and yet melt easily in the mouth. The Register.—Still another important point remains, for by means of the register the cheese-maker can ascertain the requisite conditions in both milk and curd for the production of tine cheese. The daily use of such a one as that, of which an example follows, gives an opportunity for fixing definitely the quantity of rennet, the different temperatures, &c. Under Remarks may be noticed the peculiarities of weather, taints, and the probable causes ; indeed, any point of interest to the maker, and which for reference and comparison will serve as a compass by which to steer the future course. Each day's cheese should be numbered, so that on examination the conditions under which it was produced can be had from its corresponding one on the register. By successive comparisons and tests, it is easily seen that at length a fairly intelligent maker will achieve success, In fact, the use of the register is indispensable if a thorough acquaintance with the business is to be obtained. The foregoing instructions apply to the system in which the temperatures are raised through the use of hot whey, as well as in that where steam is altogether used for this purpose. For "ripening" and scalding, the temperatures are the same in both systems—for scalding, the whey being heated to from 100° to 140°. Present Market Status and future Improvement.—It may readily be admitted that a decline in quality has been marked in a large section of Scotch Cheddars—even maintained that more general success ought to be achieved with our present knowledge. The causes of the decline have been referred to in noticing the appointment of an American expert; but there are others to which I will now refer. In the first place, the person to be entrusted with making a large dairy of cheese should be selected. Not only general intelligence—for the exercise of which there is enough opportunity—but certain other qualifications should guide that selection. Large power of perception, strict attention to duty, promptness in acting on good judgment, quickness and accuracy of the eye, the smell, and the taste, and above all in an eminent degree the cardinal virtue of patience, will most likely characterise the successful operator, And it is for employers to judge how far remuneration should accord with results, the opinion of the writer being that the salary should be regulated thereby, and thus merit have its reward. This suggests, what has lately stirred inquiry as regards the best mode of instruction, and there can be little question of the wisdom of establishing dairy schools, a subject well deserving the consideration of the Directors of the Highland Society. But like other educational establishments, they should have their inspectors, not only to deal with the schools, but be of service on the individual farms, when required. And it is well worthy of the attention of farmers, who have either small holdings or have been unsuccessful on the average, how far the factory system, or at least associated dairying, could be substituted. But if dairy farming is conducted as at present, then the farmer should himself become conversant with the peculiarities of the farm and dairy, and the management best suited to them, so that he might be able to instruct the new hand, to whom he is to entrust this important branch. Not only will this study prove interesting but profitable, besides conferring a boon on the class of consumers who will pay a good price for a good article—one widening daily, and whose demand is more than the supply. On these grounds, all interested in dairy produce should unite in common effort, so that, as illustrated at our great national shows, improvement lately made should be maintained and continued until a level is reached which, if not the highest, will at least be abreast of that attained some twenty-five years ago. And it has frequently occurred to the writer, that, for the smaller dairies especially, there should be an effort made to acquire a knowledge of the making of fancy cheese, which brings a higher price than Cheddar. A deputation, composed of perhaps three farmers or dairymen—one of whom, at least, could make good cheese—should put all on an intelligible record, while the whole three being conversant with the principles and practice adopted at present, and the variations which they would notice abroad—could hardly fail to convey the information which would be needed to make marketable Roquefort, Gruyere, Gorgonzola, and other fancy cheese. As an example of what has been done in America, a friend of the writer assures him that he found as fine Gruyere, which had been made in Ohio, as any he had tasted in Switzerland. Science.—The phenomena accompanying the changes in milk are well known as regards their existence, but very indifferently understood as to their true nature, and the means to be exerted in controlling them. The cheese-maker, having settled in his mind the method to be adopted, begins to study it, very probably imperfectly, but much more likely without any study, begins to put it into practice. He will most likely forget to consider carefully the many details which effect the product, and follow slavishly some given process without considering the circumstances which affect it. The application of theory alone, without that close and intelligent observation and attention through which successful practice can only be attained, will end in failure more or less complete. How often do we see all the advantages of sound instruction and good example fail to produce anything approaching a uniformly fine make, and not less so that on one removing to another district —it may be an adjoining farm—the change is marked by a vast difference in the relative superiority or inferiority of the cheese. This just shows that what might be good practice is often the reverse for want of sufficient knowledge. But the converse is equally true, for often the failure of those, who apparently have all the system at their finger ends, is to be attributed to want of observation and strict attention to detail. The question then arises, What has science done for cheese-making ? and the answer must be, that while in other industries development has, from this source, been very rapid and well marked, in this one little benefit has been derived. The application of steam, the use of the thermometer and litmus paper, come under this category, but are not begotten of special aim. Farmers no doubt are to blame for ridiculing science as unreliable, but the best practice can only be founded on sound theory. And there is no doubt that the best stage for withdrawing the whey—viz., before acidity could be detected by any but the most minute test, but not, as Voelcker contended, without its presence at all—should have been readily answered at any time on the question being put to a competent chemist. Science has even done more ultimately; it gives us the reason,, The lactic acid which developes in the milk, through a chemical change of the milk sugar, has the power of dissolving some of the mineral constituents—such as the phosphates of lime, magnesia, and iron, the former having a large representation in the ash of milk. If then acidity is too far advanced before the whey is run off, the curd loses some of its constituents, which, when the cheese is ripe, render it less palatable and more indigestible. There are still a great many queries to be propounded to science ; and it is to be hoped the answers will be so explicit as to contribute largely to the improvement of dairy produce. The analysis of newly drawn milk; the change in the volume, and the constitution on the evolution of the animal odour; a minute and easily understood test of the acidity present at the first, and the progressive stages of change, demand attention. The constituents which may by accident of weather or otherwise be lost, should be capable of being replaced, and it is for the scientist to tell us how. He ought to be able to tell—-from the composition of milk and the surrounding circumstances—what alteration of process would be required. In short, the peculiarities of any farm could be duly considered, if the scientific reasons were given. The Americans have gone ahead of us in scientific investigation, and it is high time some of the best talent should be turned in this direction. Concluding Remarks.—In conclusion, it may be remarked that benefit has, in several ways, been received from the appointment of an American expert; not only in the general stimulus given by a true appreciation of our position generally in the market, but in the actual improvement of the process and the product. At the same time, it cannot be denied that, with exceptional skill, a few makers had as good cheese when made with sour whey; but it is just as certain, that with a judicious adoption of the alterations noted in Mr Harris' practice, more uniform success would follow. The dairy school, and a qualified inspector, seem the only improvements likely to be engrafted in the general system and individual effort, and there is every likelihood that with more scientific aid, more systematic instruction, better buildings and mechanical applicance, the average quality will be raised.